Not even Italian bureaucracy could stop us heading off on another walk today, although there were a couple of moments where we might have wished it had done so. We’re apparently here before the season starts. Amusingly, many things we have read extol people to come just now before it gets crowded, but the advertising guys don’t seem to have talked to the people actually running the show. There are so many paths closed that they won’t sell you a proper pass to the area. Because you can’t buy a pass they wont give you the decent map that comes with the pass. And as a result we spent quite a bit of time today poring over the iPhone and the rough sketch that passes for a map that we have. Anyway we came up with a plan and started by walking along the Via del Amore to Riomaggiore again this morning and then headed up the mountain behind the town. 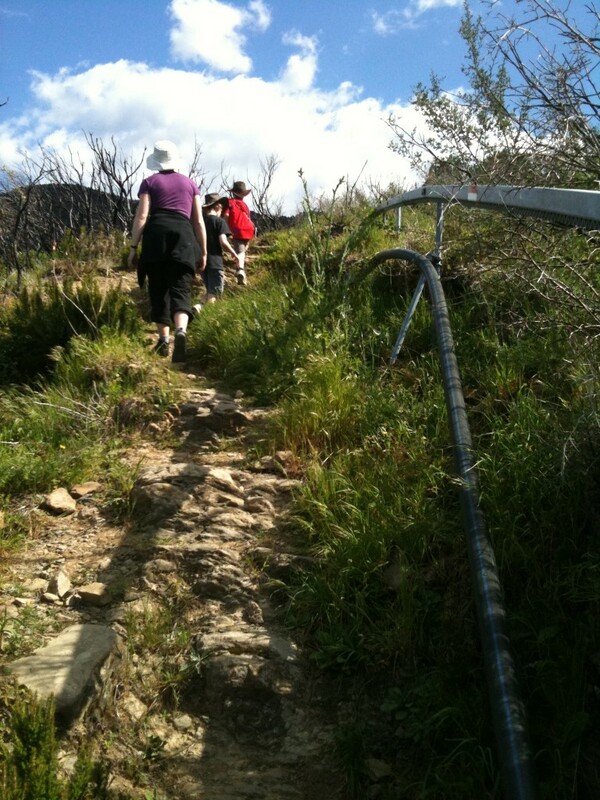 The walk up through the vineyards is your basic march up a 50 degree track. There are no gentle zigzags or anything to save your legs. Its exhausting but the view once you get up high and regain your breath is stunning and completely worth the effort. As you continue past the vineyards the path starts to fade to nothing. 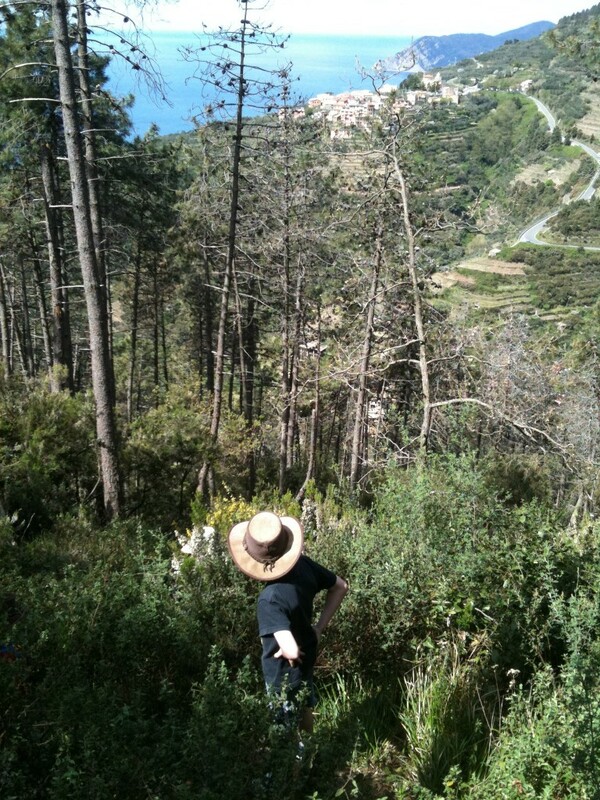 Going further up you leave the vineyards behind and move into a scrubby pine forest. At this point the path is marked largely by a vague space between bramble bushes. Eventually you come to a horse track that follows a contour laterally along the mountainside. 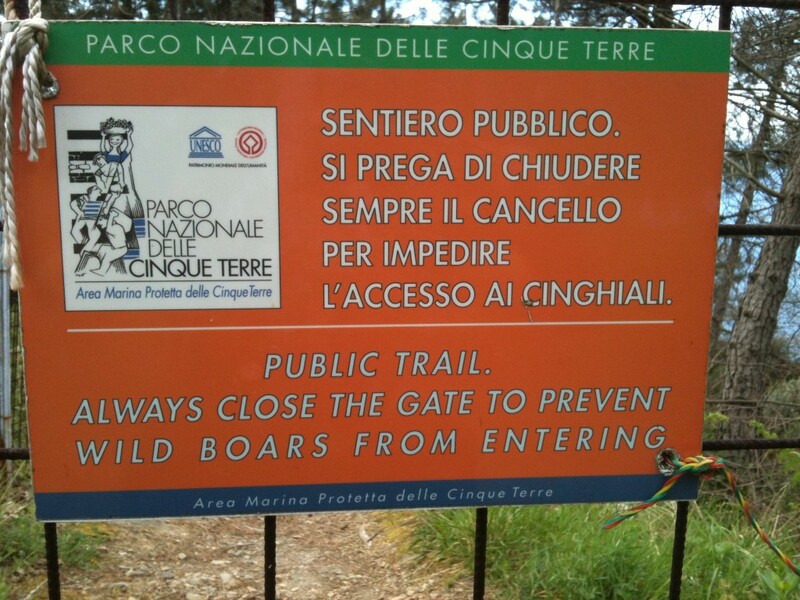 We were very amused to see a sign explaining that the gate between the path and the track was to keep wild boars out. (You probably have to be as big a fan of Asterix as the boys to really appreciate their excitement.) Although there were no wild boars to face down, the boys did demonstrate their bravery by testing out the electric fence beside the gate – with their hands. 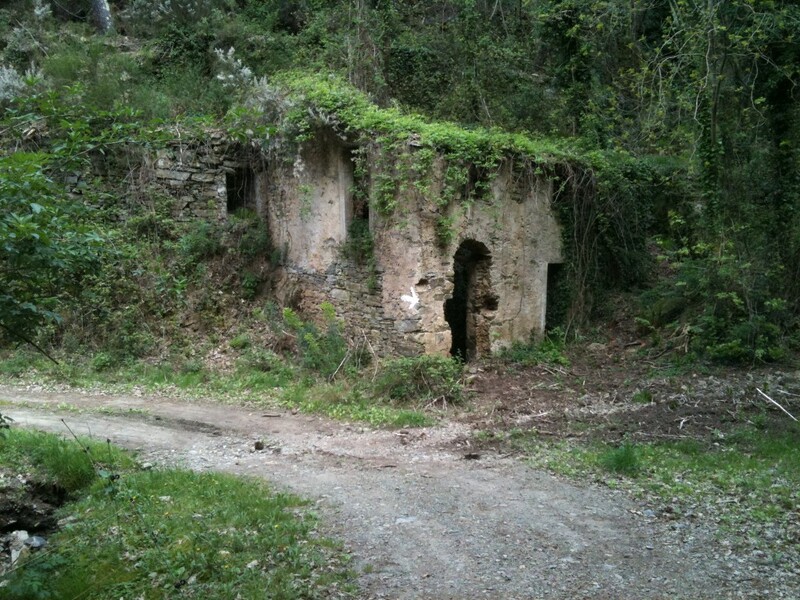 We followed the horse trail around a valley to a ruined house where we stopped for a snack. There are quite a few ruined huts about the hillsides. I’m guessing that the locals used to move up there for harvesting and planting rather than commuting. These days there is a network of little monorail tracks that cover the mountainside. The ‘train’ is a converted lawnmower with a cog attached to the motor and a plastic seat bolted on to the back. It must be a wild ride coming back down. Walking beside the local monorail. A while after our snack we came to a five-way intersection that we guessed included a way back down to Manarola. Which one of the paths though? 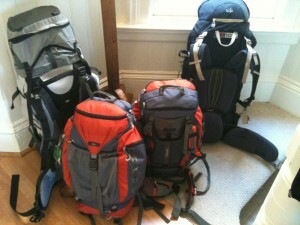 We eventually settled on one of them and headed down the hill. This time the ‘path’ had only the vaguest pretensions to clarity. A storm must have hit the hillside we were traversing sometime in the not too distant past. There were toppled pine trees all over the place and this part of the journey involved as much scrambling and clambering as walking. 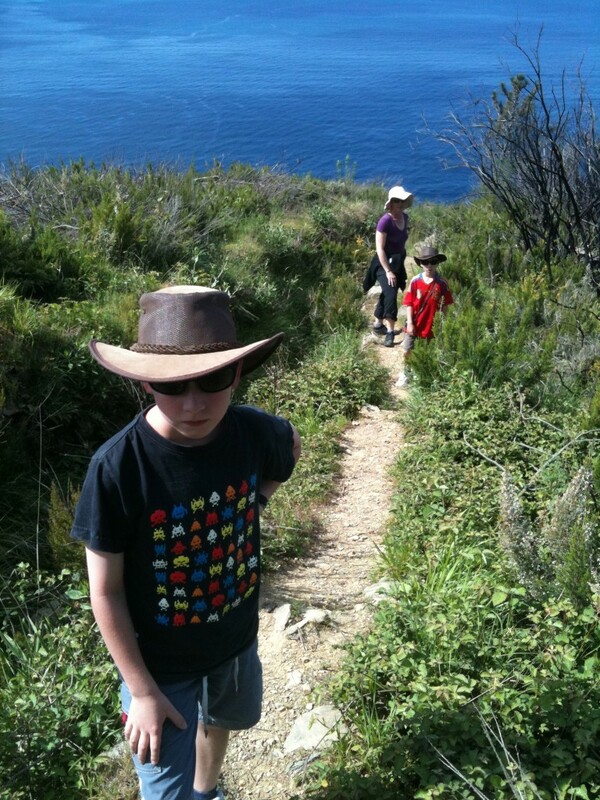 Callum on the downhill “path”. In the end we stumbled tiredly back into Manerola. The advantage of climbing up a coastal mountainside is that we were never lost – we could always see where we had come from and where we were going to – we just weren’t always sure how we were going to get to where we were going. Regardless it was a lovely walk and we ended up with a great feeling of satisfaction that we’d made it all the way back. 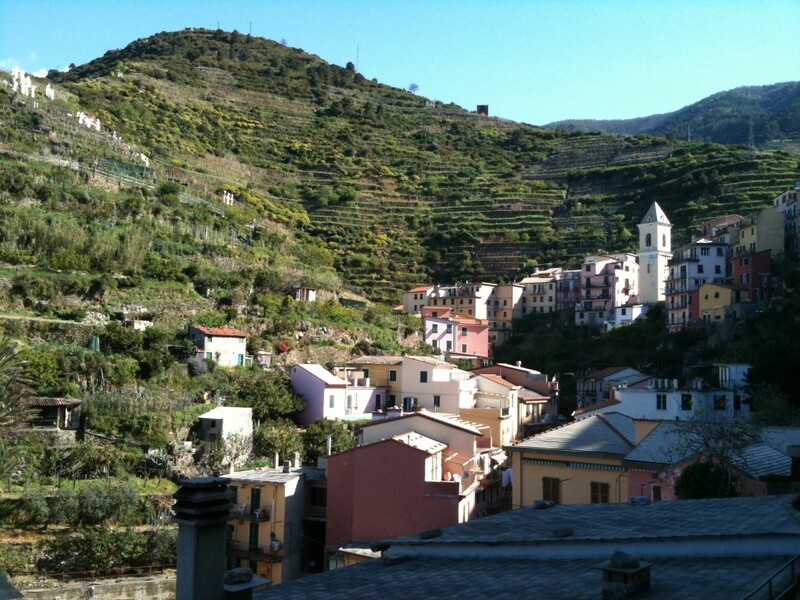 For some better quality photos see our Flikr photostream on Cinque Terre here.